3954 Police Officer Key Chain is a Town Key Chain which was released in 1996 and 1998. 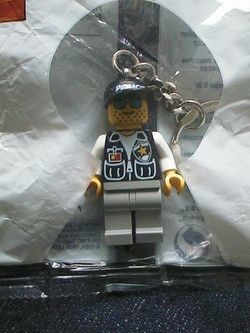 The keychain contains a single object, that of a police officer minifigure. The officer is wearing grey pants, a black shirt with white arms, along with yellow hands, and is wearing a black cap. The shirt contains printing suggesting elements such as a police badge, pockets, and ID tag, and a zipper, as well as a white undershirt and folded-down collar. The cap the officer wears has printing on the front reading 'POLICE'. His face contains printing suggesting large amounts of stubble, as well as a smiling mouth and eyes with blue sunglasses. A keychain attachment is screwed into his head, enabling him to be attached to a keyring. Facts about "3954 Police Officer Key Chain"
This page was last edited on 3 May 2016, at 00:40.